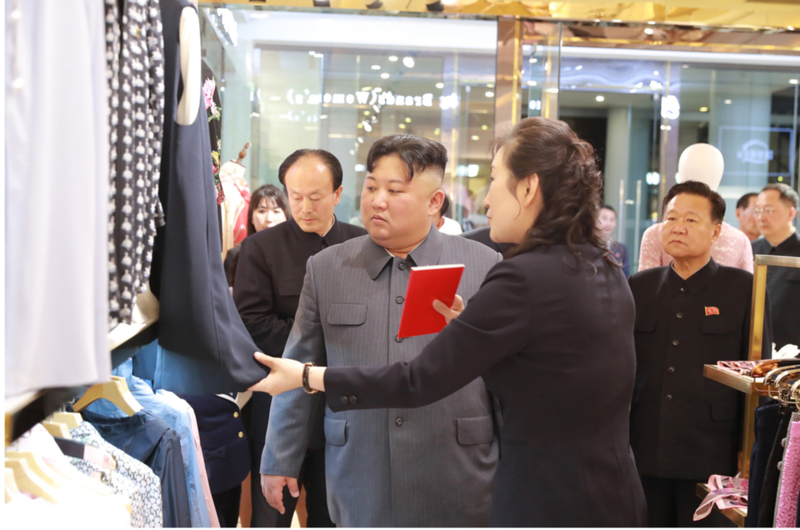 Kim Jong Un is briefed about products for sale at Taesong Department Store in Pyongyang on April 8, 2019. 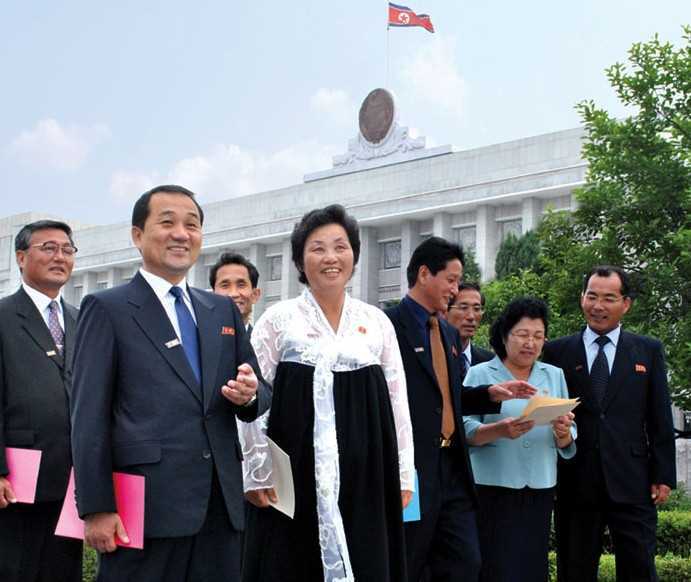 In the background at the right appears to be DPRK Foreign Minister Ri Yong Ho (Photo: Rodong Sinmun/KCNA). The 14th Supreme People’s Assembly [SPA] opens its five-year term of office with its first session. In the days leading up to the SPA’s convocation, Kim Jong Un (Kim Cho’ng-u’n) conducted a walk through of the renovated and expanded Taesong Department Store leading up to the store’s grand re-opening. Also in attendance were Light Industry Department Director An Jong Su (An Cho’ng-su) and other development and economic officials of the State Affairs Commission (explicitly ID’d by DPRK state media), as well as a few diplo-foreign policy types such as IAD deputy director and working level China conduit Kim Song Nam. This might foreshadow an SPA opener focused on economic development (with Cabinet updates on the Five Year State Strategy) and external relations. 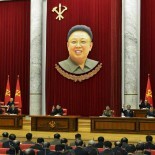 It remains to be seen if the WPK Central Committee or Politburo will convene ahead of or just after the SPA. This article was written on 10 Apr 2019, and is filled under 2007-2010 kpa management, Agriculture Department, basic party organizations, Central Party Affairs/Cadres 5th Section, central party life, Civil Defense Department, Comprehensive Affairs, Events Management Section, Executive Policy Bureau, Finance and Accounting, General Affairs, General Federation of Science and Technology of Korea, General Federation of Trade Unions of Korea, ideological slogans, III Army Corps, Im Chol Ung (DPRK Vice Premier WPK PB), Im Hun (North Hwanghae PPC), Inter-Korean Relations, internal security, International Affairs Department WPK, International Department, Jagang KWP Provincial Committee, Jagang Provincial People's Committee, Jang Chang Ha (MID), Jang Chol (State Academy of Science President), Jang Chun Sil (KDWU), Jang Pyong Gyu, Jang Ryol, Jang Su Gil, Ji Jae Ryong, Jo Yon Jun (OGD), Jo Yong Won, Jon Kwang Ho, Jon Yong Nam (KISYL), Jong Kyong Thaek (State Security), Jong Sung Il (WPK CC), Ju Yong Gil (GFTUK), JVIC, Kaeso'ng City (municipal) KWP Committee, Kaeso'ng City People's Committee, Kang Ji Yong, Kang Jong Gwan (Minister of Land and Marine Transport), Kang Kwan Chu, Kang Pong Hun (WPK CC), Kang Sil Bong [UAWK], Kang Yang Mo, Kang Yun Sok, Kangwo'n Provincial KWP Committee, Kangwo'n Provincial People's Committee, Kim Chang Gwang (SED), Kim Chang Son, Kim Chang Yop (UAWK), Kim Chol Gyu, Kim Chong-un inspections, Kim Chun Sik [MPCS], Kim Chun Sop (Jagang WPK PC), Kim Family, Kim Il Sung Youth League, Kim In Sik (Vice Premier/CCCGC/MPS), Kim Jae Ryong (Jagang WPK Provincial Committee Chief Secretary), Kim Jong Im, Kim Jong Un Visits, Kim Jong-un, Kim Ki Nam, Kim Ki-nam, Kim Kwang Hyok (KPAF), kim kye gwan, Kim Kye Kwan, Kim Kyong Jun (Land and Environment), Kim Nung O (NPyongan WPK), Kim Phyong Hae (Cadres/NPYPPC), Kim Pyong Ho (PAD), Kim Song Hye (UFD), Kim Song Nam (IAD), Kim Sung Du, Kim Thae Hi (KISU KWP), Kim Tok Hun, Kim Tong Un, Kim Tu Il, Kim Ung Chol (NDC), Kim Wan Su, Kim Yo Jong, Kim Yo-chong, Kim Yong Dae, Kim Yong Gwan (Metallurgical Industrites DPRKC), Kim Yong Hun (CC KWP Dept. Director), Kim Yong Jae (FA), Kim Yong Jin (DPRK Vice Premier), Kim Yong Nam, Kim Yong Su (WPK CC DD), kisyl, KJI Personal Secretariat, KJI-Ko Yong Hui Family, Ko In Ho, Korean Committee for Cultural Relations with Foreign Countries, Korean Democratic Women's Union, Korean People's Air Force, Korean People's Air Force [KPAF], Korean People's Army Air Force, Korean People's Internal Security Forces, Korean People's Army (KPA), Korean Social Democratic Party, Korean Workers' Party (KWP), KPA construction battalions, KPA construction brigades, KPA East Command Zone, KPA External Relations, KPA General Logistics Department, KPA General Political Bureau, KPA General Political Department, KPA General Propaganda Department, KPA General Staff, KPA infantry corps, KPA Large Combined Units, KPA Organization Department, KPA Party Life, KPA supernumerary organizations, KPA WPK Committee, kpif, Kwak Pom Gi, Kwon Hyok Bong [PAD], KWP Science and Education Department, land and enviroment, Light Industry Department, Local Party Affairs, local people's committees, Lt. Gen. Cha Tong Gil, Lt. Gen. Jang Chang Ha, Lt. Gen. Jon Il Ho, Lt. Gen. Ju Song Nam (815th Mechanized Division GPD), Lt. Gen. Kim Jong Gwan (MPAF), Lt. Gen. Kim Myong Nam (PDC), Lt. Gen. Kim Su Gil, Lt. Gen. Kim To Un (PDC GPD), Lt. Gen. Ko Myong Su (815th Mechanized Division), Lt. Gen. Pak Yong Ung, Lt. Gen. Pang Kwan Bok (GS/Training Bureau), Lt. Gen. Ri Song Guk (IV Corps), Lt. Gen. Son Jong Nam, Lt. Gen. Yun Yong Sik, LTG Kim Yong Bok, Ma Wo'n-ch'un (AD), Machine Building Industry Department, Main Office of Adjutants (Central Party Office #6), Maj. Gen. Ri Yong Chol (IV AC GPD), military economy, military security command [msc], Ministry of Atomic Energy and Industry, Ministry of Culture, Ministry of Finance, Ministry of Foreign Affairs, Ministry of Land and Environmental Protection, Ministry of Metallurgical Industry, Ministry of Mining Industry, ministry of people's security, Ministry of Public Health, Ministry of State Natural Resources Development, Ministry of State Security, Ministry of the People's Armed Forces (MPAF), MPAF GPB, Mun Kyong Dok, Namp'o WPK Committee, National Economic Development Commission, National Peace Committee of Korea, National Reconciliation Council, Navy Command, North Hamgyo'ng Provincial People's Committee, North Hamgyo'ng WPK Provincial Committee, North Hwanghae Provincial KWP Committee, North Hwanghae Provincial People's Committee, North Pyongan KWP Provincial Committee, North Pyongan Provincial People's Committee, nuclear weapons, O Su Yong, Office of Military Officers, On the Spot Guidance, Organization and Guidance Department, Paek Kye Ryong, Pak Chol Min [KISYL], Pak Chun Hong (CC KWP), Pak Chun Nam (MOC), Pak Jong Nam (Kangwon WPK PC), Pak Kwang Ho (PAD), Pak Myong Sun (WPK LID), Pak Pong Ju, Pak Thae Song (KWP CC Dept), Pak Yong Ho, Party History Institute, party life, Party Life Guidance, Political Bureau, primary party committees, Propaganda and Agitation Department, Provincial Party System, Provinicial People's Committee, Public Events, public safety, Publication Guidance Bureau, Pyongyang City People's Committee, Pyongyang Defense Command, Pyongyang WPK Committee, RAdm Pae Un Chol, Rajin-So'nbong People's Committee, raso'n, Raso'n Economic Zone, Raso'n WPK Committee, Reconnaissance Bureau, reserve training units, Ri Chang Gun (WPK CC DD), Ri Chang Son, Ri Chol, Ri Chol Man (DPRK Vice Premier/Minister of AG), Ri Hi Yong [NHAM WPK PC], Ri Hye Jong, Ri Il Hwan, Ri Jong Guk, Ri Jong Mu (Physical Culture and Sports Minister), Ri Ju Bong (MPCS), Ri Ju O (DPRK Vice Premier), Ri Man Gon (N. P'yo'ngan WPK PC), Ri Pyong Chol, Ri Ryong Nam, Ri Sang Gwan [NH PPC], Ri Sang Won (Yanggang WPK PC), Ri Son Gwon (CPRC/UFD), Ri Song Uk (KCUST WPK C), Ri Su Yong, Ri Yong Chol (IAD), Ri Yong Chol (IV AC PC), Ri Yong Ho (FA), Ri Yong Rae, Ri Yong Sik (Rodong editor), Rim Kyong Man (Raso'n WPK), Ro Tu Chol, rural management committees, Ryang Jong Hun [NHWA WPK PC], Ryang Won Ho (PHI), Ryanggang KWP Provincial Committee, Ryanggang Provincial People's Committee, Ryu Myong Son (WPK CC IAD), Second Economic Committee, Second Economy Commission, Secretariat, Sin Hong Chol (FM), Sin Kyong Man, Sin Man Gyun (WPK LID), Sin Yong Chol, Sinuiju City People's Committee, So Ho Won [CCRFC], social control, Sohae Space Launching Station, Son Kwang Ho (Physical Culture and Sports), Song Il Ho (MFA), South Hamgyo'ng KWP Provincial Committee, South Hamgyo'ng Provincial People's Committee, South Hwanghae KWP Provincial Committee, South Hwanghae Provincial People's Committee, South P'yo'ngan KWP Provincial Committee, South P'yo'ngan Provincial People's Committee, State Affairs Commission, State Planning Commission (SPC), State Security Department, Supreme People's Assembly, Tae Jong Su, Thae Hyong Chol (KISU President-MOHE), theoretical works, uawk, Uncategorized, United Front Department, VADM Kim Myong Sik (KPAN), worker peasant red guard, Worker Peasant Red Guard, Workers' and Social Organizations, WPK Economic Affairs Dept, Yang Hyong Sop, Yanggang Province, Yangkang Province, Young Red Guard, Yun Tong Hyon.